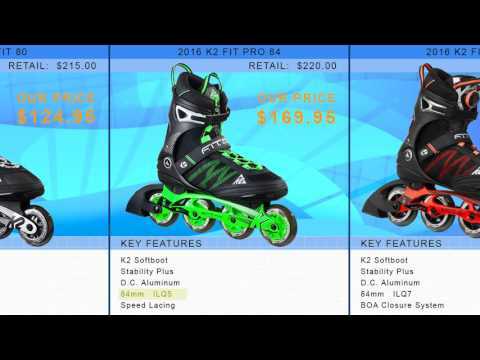 The pinnacle of the K2 line is their K2 FIT 84 Boa Inline Skates. These are the skates that offer it all. From easy lacing to comfort to speedy wheels, these are the skates that make the recreational, working-out skater love what they do. For starters, you'll have the Boa Closure System which makes getting secure inside your skate quick and easy. A few turns of the dial will have you comfortably inside your boot with adjustments on the fly being super simple. The Stability Plus Cuff were made for recreational and fitness skating and offer lots of support and versatility. Built with DC Aluminum, the frames make maneuvering easier, give you lots of stability but also maximize power transmission to each stride you make. These skates comes with 84mm wheels which are durable and provide a smooth roll. Add to it the ILQ7 bearings and you'll have an excellent glide with each roll of the wheel. From leisurely skates around the park to the fitness-oriented skater looking for comfort and performance, the versatile and supportive K2 FIT 84 Boa Inline Skates are simply unbeatable. Very satisfied with these skates. I have used them a couple of times now and they’re awesome. A: These are ILQ 7 bearings which is K2's rating system and are equivalent to an ABEC 7 rated bearing. Q: I recently purchased a pair of K2 F.I.T. 80 Boa inline skates 2018 for my son in a size 7.5 (he wears a size 7 shoe) and had to return them as they were too small. My question is: Is the sizing on these same? I see you only have these in sizes 5 and 8, but I think he would like these better because of the color, aluminum frame and faster bearings (as long as they fit; I don't want to have to return another pair of skates). A: I would recommend having your sons foot measured, most shoe specialty stores can accommodate this. K2 skates fit the same as shoe size, so if he is a size 7 the size 7.5 if anything should have been a little loose; I have a shoe size of 10.5 and have had several K2 skates in that size including my current skates. Keep in mind that skates can take up to a handful of times skating in them to fully break in and you want a fairly snug fit for performance. It's hard to recommend a size since the size 8 may feel correct if he is used to wearing looser casual shoes but once broken in and he is skating in them they could be too large which could lead to discomfort and blisters. I'd start with measuring his foot and go from there. Q: If I am a size 8 with Rollerblade skates, would it be the same with K2? I read somewhere there are differences with the different brands. A: I skate with both K2 and Rollerblade brand skates and have found both brands fit very similar, and both fit the same as standard shoe size. I wear a size 10.5 and take a 10.5 in both brands. You can expect some break in time with either brand. Q: My son's shoe size is 6, should I order skate size 6? 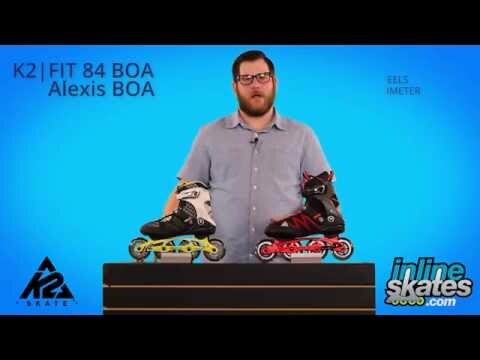 A: Inline skates fit the same as standard shoe size so the 6 is the correct size for your son. Q: Is this skate in men's sizes? I wear a 7.5-8 in women's and want to make sure I don't order too big of a size for myself. A: These are sized in men's sizing so if you wear a size 7.5 in women's you will want to drop down a full size to 6.5 - We do have a women's specific model of this skate, the K2 Alexis 84 Boa, which will offer a women's specific fit which is a bit narrower and offers a slightly lower cuff support in the back to accommodate a woman's calf muscle. Q: Will you be getting these in a size 11 anytime soon ? A: No, these are from a previous season so unfortunately the sizes we currently have are going to be the only sizes available. We do have the 2018 model of this skate currently available for pre-order. Q: Hello, I previously owned a pair of K2 F.I.T. 80 in a size 9.5 and I noticed that no skates have half sizes. Do you not carry half sizes or do they just not make half sizes anymore? The 9.5 fit perfectly so am afraid to purchase without clarification. For shoes my size varies from an 8.5-9. A: We do offer many skates in half sizes but not all skates are offered in or ordered in 1/2 sizes. I am worried that 9.5 is too large for you though based on the shoe size you state in the question, if you wear a size 8.5 or 9.0 in a shoe you should be in a size 8.5 or 9.0 shoe size since inline skates are going to fit the same as your shoe size. In this skate that you asked the question on I would recommend someone with your stated shoe size go with the size 8.5 or 9 depending on fit preference, I personally will size my skates a 1/2 size down from shoe for a tighter performance fit. The only skaters that I would size in a larger skate size would be those with extremely wide feet, the additional room gives them the ability to add footbeds. A: You will want to drop a full size down from your shoe size so if you wear an 8.5 you will drop down to the size 7.5 - Please note men's skates do come up a bit more on the calf and if that is bothersome to your calf muscle you will want to add a heel lift to alleviate some of this pressure. Q: Can you remove the brake on the 2016 K2 F.I.T. 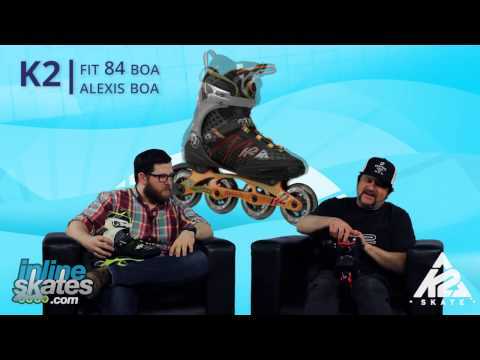 84 Boa Inline Skates? A: Removing the brake is simple, you can either just remove the pad portion to get it out of the way or remove the whole thing. Removing the whole thing will require a smaller axle or some spacers on the existing. We can order shorter axles for those looking to remove the brake on their skates. Q: I was wondering if the durometer would be okay to skate indoors? so I wouldn't be slipping and sliding. A: These wheels will be fine for indoor skating and will actually be very grippy on most surfaces. You run into issues when you use the skates both indoors and outdoors since outdoor skating will cause the wheels to pick up debris and actually make them slippery on the smoother indoor surface. Some rinks require that you don't skate outdoors with the wheels you are using to skate indoors.